Blue Rose Epics | Entertainment: Team Snow vs. White Walkers in Fan-Made Game of Thrones Trailer! Team Snow vs. White Walkers in Fan-Made Game of Thrones Trailer! 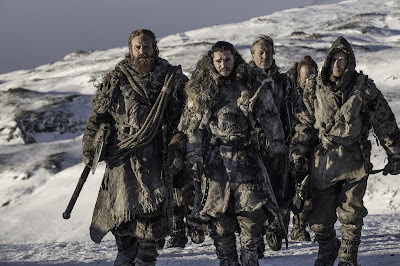 "We come from the land of the ice and snow, from the midnight sun where the hot springs blow...." A fitting description of Jon Snow and his relatives, the Starks of Winterfell from Led Zeppelin's Immigrant Song, which features prominently in a new Game of Thrones fan-made trailer by video editor Nick Growall. "Game of Thrones: Beyond the Wall" Trailer is blowing up across the internet featuring the ragtag crew of Jon Snow's men-on-a-mission movie in the middle of Game of Thrones Season 7. And yes, it is as awesome in the show as the trailer suggests. Watch tonight's episode "Beyond the Wall." It is one of the best episodes of the series. The trailer is very well done, with hints of 70's exploitation cinema editing tricks that would make Quentin Tarantino proud. This trailer does a good job of setting up the true awesomeness of this heroic team up. 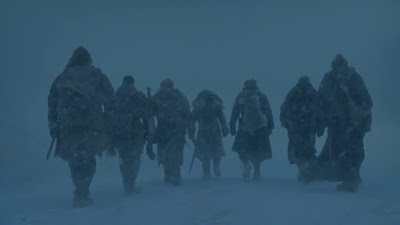 One expects The Magnificent Seven, Suicide Squad, Inglourious Basterds, Wild Bunch, The Dirty Dozen, and Guardians of the Galaxy to join Team Snow after their mission is complete and lift up a drink for them in Valhalla. Late Night Twin Peaks Parody!